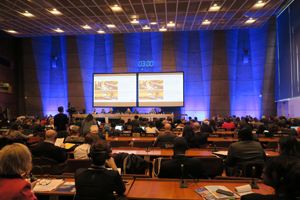 The 40th Session of the World Heritage Committee 2016 was held at UNESCO headquarters in Paris from October 24th through 26th, 2016. This session was a restart of the deliberation in Istanbul suspended due to the attempted coup d’etat. Three staff members of the Institute attended the session in Paris. At the session of the Committee, whether minor changes of the sites in the list of world heritage sites should be accepted was deliberated, and the extension of the two pilgrimage routes totaling to 40.1 km of the “Sacred Sites and Pilgrimage Routes in the Kii Mountain Range,” for which Japan had made an application, was approved. As for the temporary list where each member country recommends the registration of its sites with the list of world heritage sites, Japan’s addition of “Amami-Oshima Island, Tokunoshima Island, the northern part of Okinawa Island and Iriomote Island” (Amami & Ryujku) to its temporary list was confirmed. For “Amami & Ryukyu,” preparations toward listing as a world heritage site in 2018 are ongoing, but this confirmation formally enabled Japan to submit a written recommendation. At present, Japan’s temporary list has ten sites including this added one. The Committee also revised the “Operational Guidelines for the Implementation of the World Heritage Convention,” where the procedures for registration recommendation and reporting on conservation conditions are stipulated. So far, each member country may recommend the registration of two sites per session of the Committee (one of them must be a natural heritage site or a cultural landscape). From the 44th session of the Committee in 2020, the number of sites to be deliberated for each county will become one. At the same time, the number of recommendations deliberated at each session will be reduced from 45 to 35. When the number of submitted recommendations exceeds 35, the ones from the member countries having fewer world heritage sites will be prioritized. Japan already has 20 world heritage sites, so the deliberation may be postponed even if a further recommendation is submitted. Accordingly, the deliberation opportunity available to us will become more and more valuable. Through research on the world heritage sites, we will try to contribute to reinforcement of the foundation to protect cultural heritage overseas, providing useful information for people concerned in Japan in preparing recommendations.